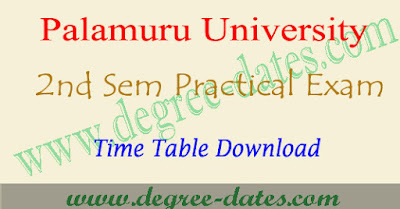 PU degree 2nd sem practical timetable 2017 palamuru university :Palamuru university officials has been revealed PU degree 2nd sem practical exam notification for the session 2017. 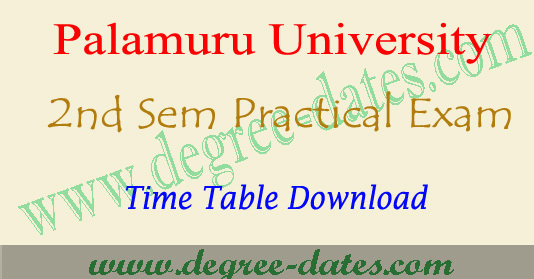 Palamuru university degree 2nd sem practicals starts from 1st May 2017 for Regular candidates of B.A/B.Com (General)/ B.Com. (Computers)/B.Sc. Semester I (Backlog) here we are updated PU degree 2nd sem practical timetable 2017. The Practical Examination schedule of B.A/B.Com/B.Sc. (CBCS) Semester-II May, 2017 as follows.It is hereby notified to all the eligible Regular candidates of B.A/B.Com (General)/ B.Com. (Computers)/B.Sc. Semester I (Backlog) and Semester- II (Regular) May 2017, as follows. To make arrangements to conduct the Practical Examinations notifying the exact dates of examinations to the concerned candidates. To conduct the Practical Examination on the basis of Nominal Rolls submitted by the Principal or on the basis of Hall Ticket of the candidate. To send the Answer Scripts, immediately, but not later than 09-05-2017 along with the ‘D’ forms and the award list in duplicate in the same bundle.